Pregnancy is a magical and mystical moment and the yoga practices need to be refined to hold the time sacred. After the birth of the child we need to stay close to ourselves so that we have the juice to nourish another. Join us in celebration, preparation for, and healing from childbirth with this series of prenatal and postnatal yoga practices. It is important to take the time to nourish ourselves. Join Eden for a dynamic fluid sequence explore flexibility, ease, and strength in the pelvis. Eden guides us through a gentle and loving meditation designed to connect us with our babies and ourselves. Congratulations on your new baby! We're so happy you're here sharing in these practices with us. Eden will guide us through sequences to heal and rebuild strength, and as always, you're encouraged to listen to your body and modify as necessary. This season also includes some practices that incorporate your little one, so you both can enjoy. Eden has just had her second baby and will share some road-tested practices to heal and rebuild strength after childbirth. Eden offers a gentle grounding practice for new mamas. Eden offers a guided meditation to promote stillness and connection. This season, Maria will explore slow and active prenatal practices to nourish and support your journey into motherhood. Maria welcomes us to this season, where she will share a variety of pre-natal practices to help support you through the various stages of pregnancy. Maria shares a talk about her experience with pregnancy—her struggles, lessons she has learned, and how her yoga practice has changed. Maria guides us in a modified practice of Sun Salutations A and B, offering variations along the way so that you can continue to flow comfortably. This season Maria Villella is back and will share postnatal practices to support you during this very special time in your life. These sequences will be focused on twisting, core, flexibility, and rebuilding your pelvic floor. You will feel nourished, strong, and supported. Maria welcomes us to this season of Yoga for 2, where she will share postnatal practices to support you during this very special time in your life. Maria shares insights about becoming a mother and the importance of self-care in the midst of postpartum. 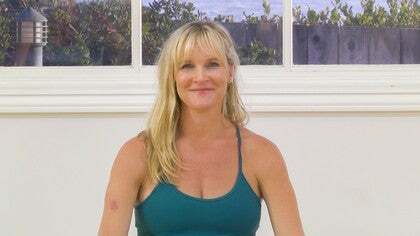 Maria guides us in short practice to help us reconnect and rebuild strength and awareness of the pelvic floor.